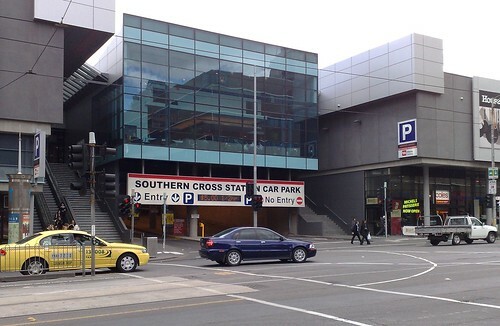 DFO has moved from Spencer Street to South Wharf. Oh, well done fellas — a move from an easy-to-get-to spot, to some godforsaken new place which nobody can find. Apparently they weren’t happy with their high-profile location, being next to a major railway station. For motorists they also had a big car park underneath (though why the government actually allowed a huge inner-city railway station to have a big car park as part of the development, I really don’t know). So anyway, where exactly is South Wharf? Down on the south side of the river, next to that delightful blight on the landscape, the M1/Montague Street interchange, and a good ten minute walk from the nearest tram stop. For those driving, why would you bother fighting your way through the inner-city freeway traffic to get to the same old stuff provided at suburban centres? But I love the way the DFO map looks, with Essendon somehow being SW of South Wharf, and Moorabbin being out in Gippsland somewhere.